Our family has been using the I Saw Jesus in You Today plate from Teachable Moments for several months now and it is such a great teaching tool in our family. It’s a practical and loving way to show a family member that we appreciate the Christ-like behavior that they demonstrated. I love that it helps reinforce godly behavior when we see it and it’s fun when our kids surprise us and honor us with the plate, too! This plate came about as an idea from a wonderful godly grandmother who wanted a practical way to encourage her grandchildren when their character reflected Christ. Her story of how this plate came to be is such a blessing to read. The Teachable Moments Plate is perfect for reinforcing godly character traits such as kindness, responsibility, patience, consideration for others, love, self-control, joyfulness and diligence. I love the smile on our children's faces when they come to dinner and see the plate at their spot. Our children are still growing and maturing in Christlikeness. It is such a blessing though when they initiate kindness or helpfulness without being prompted and then for us to be able to let them know in this special way how much we appreciated seeing that character trait. Not only is this plate helpful for those of us raising children, but it would also make a wonderful wedding present for a young couple because it helps establish a godly tradition early in marriage. Those first few years of marriage are an adjustment for most couples but seeing this plate in the cupboard on a daily basis is a great reminder to look for the good and not the bad in a spouse. It’s easy for us to get irritated with a spouse and to focus on the negative but when we choose to focus on the positive and encourage the godly habits that we are seeing, it gives us an opportunity to build them up rather than tear them down. Romans 14:19 reminds us to pursue peace and build each other up. Honoring a spouse with this special plate is a great way to do so. I think this plate is also a great tool for older couples to use with each other and with their grandchildren. What a blessing it would be to have a spouse honor the other one in this small way at a meal. Or, when your grandchildren come over it’s a great opportunity to help disciple them and teach them what Jesus wants to see in our lives. Ephesians 5:1 reminds us that our lives need to reflect the example that Jesus set for us. When we are following His example it will be reflected in our actions, words and spirit. This plate is a great tool to encourage a spouse or grandchild when we see them living out these character qualities. When we choose to honor someone with this plate we are helping fulfill the command in I Thessalonians 5:11 which tells us to encourage and build each other up. It is such a great feeling when our family sits down for a meal and someone is surprised to find the plate at their spot. They may not even realize what they did that was pleasing to God but it’s fun to encourage them by sharing what we noticed. In a world where most people think only of themselves, this is a great tool to encourage a loved one when they imitate Christ. Our family enjoys surprising each other with this plate when we notice something in particular that stands out about another family member. What a blessing it would be if every Christian home had one. 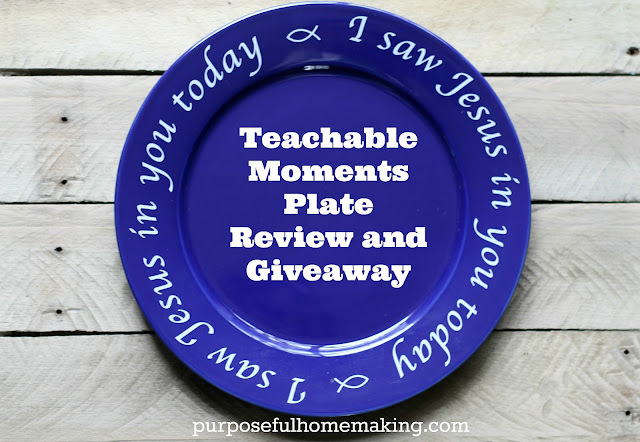 "This Teachable Moments plate is such an incredible tool to foster right heart attitudes in your children's lives. It is a practical, fun way for them to be 'rewarded' when they choose to 'be like Jesus' in the choices they make everyday. It also encourages a tight family bond when your child realizes that you are paying attention to how they interact with you (the parent) and with others (siblings, friends, etc.). We love finding the good in our children's life!" --Leesa K.
I love this! What a wonderful idea & tradition! I visited. I loved the How the Plate Started story. I visited! This would be great for our daughter! We always praise her for her good deeds but I think this would get the point across even more than just hearing us say it! I visited. I like the many comments. Your computer system as well as are not moved to your apple iphone. ituneslogin Link at the foot of this post apple is not known to roll back modifications.